We’re back with PlayStation Classics, and this time we will be looking at a classic PSOne game that is available immediately as an incredibly affordable download on the PlayStation Store for the PlayStation 3, PlayStation Portable, and PlayStation Vita. It will also be included on the upcoming PlayStation Classic. 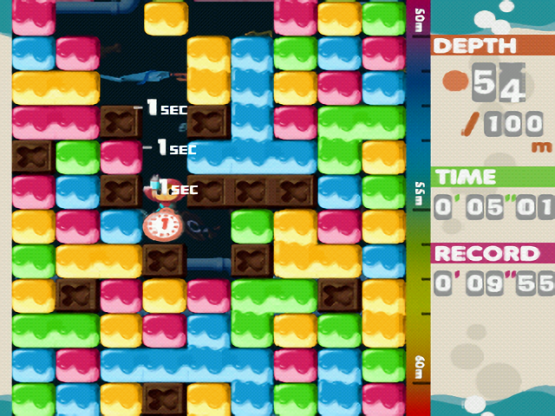 It is time to get to know Mr. Driller. As you can probably gather from his moniker, he’s a dude with a drill. Also, he knows how to use it. Do you remember Dig Dug? It was a classic Namco game about a hero named Taizo Hori who went digging through dirt to destroy the monsters found there. Did you ever play the action game Baraduke, which was also known as Alien Sector? It was a rare Namco game about a woman named Toby “Kissy” Masuyo. Why is all this important? Well, because in the canon of Namco game history, the two were once married and had a son named Susumu Hori, and young Susumu is the Mr. Driller. Taking more after his father than his mother, Susumu is a Driller. He goes around the world, drilling into various blocks in the ground so he can go deeper and deeper. 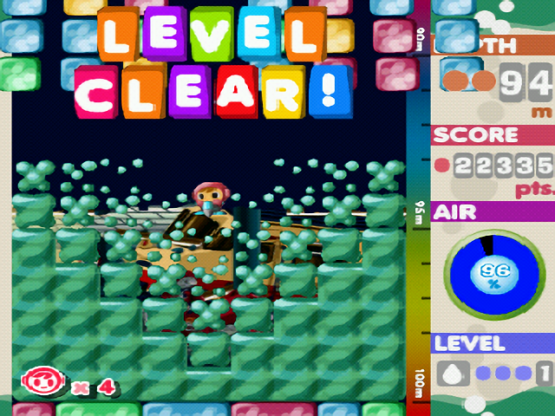 The goal is to get as far as you can with your skills before Susumu runs out of air. You know, the usual puzzle sort of thing. Unlike his parents, who both were fighting against various sorts of monsters, Susumu often seems like he is all about the the thrill of digging through blocks and trying to reach the center of the earth. 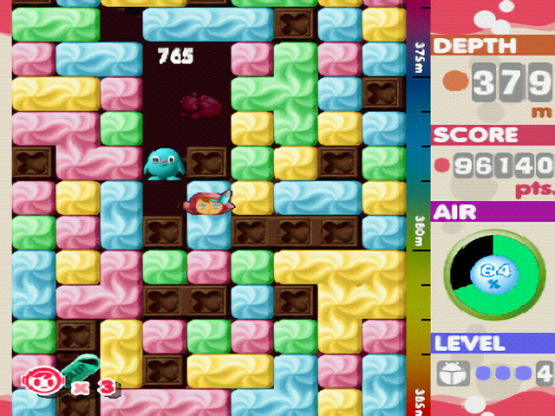 In some games, there are Undergrounder creatures who make these bright colorful blocks and are overproducing them, requiring Susumu and other Drillers to burrow through them, but other games can offer little or no reason. Mr. Driller takes place underground, which means you have to watch Susumu’s oxygen levels and keep grabbing tanks to keep playing. There is also the matter of falling blocks. See, as you go to stages around the world, your goal is to drill as far down as possible. Blocks mostly appear in four different colors, though there are occasionally special sorts of blocks, including ones that can’t be broken or require more oxygen to bust through. They only disappear if four or more blocks come together and click. This means Susumu can easily get crushed if you aren’t being cautious while quickly burrowing into the center of the Earth. Mr. Driller is a game that makes you think. You have to pace yourself, be aware of your surroundings, and think before you act. If you do well and keep things under control, you can do some major drilling around the world as Susumu. Remember, he’s the highest-ranked Driller and is depending on you to hold that title! This PSOne Classic is $5.99 in the US PlayStation Store and is ready to be played on your console and handhelds. Or, you know, you can spend $99 on the upcoming PlayStation Classic.